It seems the bad news about BPA never ceases! From canned foods to pacifiers, this hormone disrupting chemical has been a cause for concern ignored by the FDA. Today, I was shocked to read on Z Recommends that there is BPA in our wastewater and tap water! The source of this BPA contamination is recycled toilet paper. 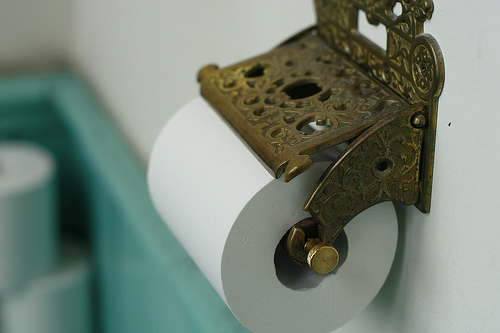 As it turns out (post-call research on my part) the source of BPA in toilet paper appears not to be that it is added deliberately to the product, but that a lot of toilet paper is made from post-consumer sources that include lots of recycled thermal printing paper (credit card receipts). Dresden University did a study examining BPA turning up in wastewater streams and traced it back to toilet paper as the culprit…Environmental regulators consider sources like this disconcerting because endocrine-disrupting chemicals like BPA and pthalates can wreak havoc on marine ecosystems. Ultimately, it’s sources like these that are the reason you probably have BPA (at extremely low concentrations) in your tap water, too. The same thing goes for other kinds of recycled paper, too. Dang, I thought I was doing a good thing for the environment wiping my bottom with recycled toilet paper. Our world has been so invaded with chemicals that it is not surprising BPA would turn up in waste and tap water. I am thankful my drinking water comes from a spring; however, the leach line in my septic system certainly must leak trace amounts of BPA from our recycled toilet paper into the soil. I just don’t want to think about what how BPA may enter my children’s bodies by using toilet paper. I guess it is time for a bidet. Our water is from a well and we do run it through a filter, though I doubt any filter would remove trace amounts of BPA. I’ve been meaning to start using them for a while. I know #2 could get messy, but even for the ladies if you only use it for #1, you could really cut down on the amount of toilet paper used! A simple covered bathroom trash can could solve the storage problem. Washing could be taken care of just like cloth diapers. @jaxin I made very similar cloth wipes out of old jersey t shirts. Just cut them in squares and sew together two layers. I used a zipzag stitch and they still are holding up after 3 years. I originally made them for my newborn but I have now found myself using and preferring them. And #2 isn’t nearly as messy as using flimsy toilet paper.